The proposed affiliation between Cedars-Sinai and Torrance Memorial—first announced last May—became official Feb. 1. The affiliation will focus on new opportunities for coordination of care and resources between the two organizations, and joint programs to provide access to more people for needed medical services—as well as access to clinical trials and the latest developments in medical research. Among the initial areas for collaboration are advanced treatments for cancer, heart disease and brain disorders. Cedars-Sinai specialists in these areas will work with Torrance Memorial physicians to provide clinical consultations for their patients and streamline patient access to clinical trials and new technologies. Each organization will continue to have its own board of directors, its own hospital medical staff and related physician organizations, and its own employees. Each organization's president and CEO (Craig Leach at Torrance Memorial and Thomas M. Priselac at Cedars-Sinai) will continue to lead their respective entities. Both organizations now are affiliated under a new parent organization with a new board of directors, named Cedars-Sinai Health System. Priselac will serve as president and CEO of the parent entity, Cedars-Sinai Health System, in addition to continuing to serve as president and CEO of Cedars-Sinai. 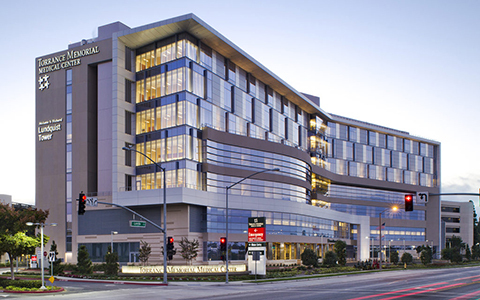 Torrance Memorial includes the 470-bed Torrance Memorial Medical Center in addition to a multispecialty physician group (Torrance Memorial Physician Network), an independent physician association (Torrance Health IPA) and an Accountable Care Organization (Torrance Memorial Integrated Physicians), which collectively include more than 500 physicians. Torrance Memorial also has several outpatient centers located throughout the South Bay region. Cedars-Sinai includes the 886-bed Cedars-Sinai Medical Center, the 145-bed Cedars-Sinai Marina Del Rey Hospital, a multispecialty physician network of 887 doctors (Cedars-Sinai Medical Network) and many primary care, urgent care and specialty care centers throughout the Los Angeles region. It also is a major research and education center, with more than 1,600 current research projects and 500 clinical trials, and trains 473 medical residents and fellows. "This affiliation enables each institution to continue the unique relationships each has with the communities it serves, while providing a platform for a wide variety of collaborations to better serve the region," Leach said. "As a community-based provider, Torrance Memorial will now have access to the outstanding tertiary and quaternary clinical services and research at Cedars-Sinai, which will be a great benefit to the entire South Bay." Priselac noted the opportunities for increasing community accessibility to healthcare with the affiliation. "While both Torrance Memorial and Cedars-Sinai have strong track records for serving the region, the governance structure of the affiliation is designed to further enhance accessibility to care and the sharing of resources to benefit patients and the community," Priselac said. Both organizations will continue their longstanding partnerships with local community organizations aimed at improving health. Cedars-Sinai (founded in 1902) and Torrance Memorial (founded in 1925) are two of California's longest-serving nonprofit healthcare organizations. In the past several years, they have collaborated on a variety of projects, including the establishment of a Telestroke program to more quickly diagnose and treat stroke patients. For more information regarding the affiliation between Cedars-Sinai and Torrance Memorial, view the Frequently Asked Questions.